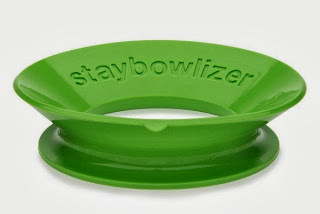 When a friend posted a photo of the Staybowlizer ($24.99) on Facebook, much conversation ensued. First, the scoffing. Then people started thinking of times when it might be useful. 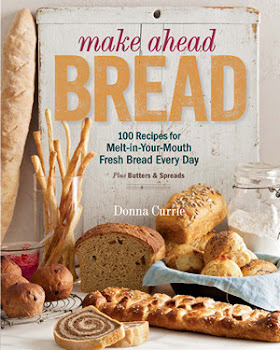 At first, I thought this was just for keeping bowls in place on the counter, like when you're whisking something with one hand and pouring with the other and the bowl tends to skitter around on the counter. Yes, you can use it for that, but you could also just put a towel under the bowl to keep it more stable, right? But after watching the video on the manufacturer's site, I thought, well, maybe it's not as silly as I first thought. When Adam Kuban said, hey, that would be great under the baby's bowl, I knew I had to take a closer look. Flip the Staybowlizer one way up, and you can nestle a bowl in the ring and it keeps it from slipping around while you're whisking or stirring. Handy for times when you need to pour and whisk at the same time. Flip it with the other side up and press the bowl down and it suctions to the counter. How secure that suction is depends on how smooth the bowl and the counter are. When I used a bowl with a textured bottom, it didn't hold nearly as well as when I used a smooth bowl. I was also able to suction a flat plate onto the counter and later I suctioned a saucepan to the counter. I'm not entirely sure why I'd need to do that, but it was amusing. I used that suction feature when I was mixing a batch of royal icing, and I have to admit it was nice to just let the bowl sit securely for all that mixing time. For a batch of cake batter, not a big deal to hang onto the bowl, but when I had to spend a lot of quality time with that hand mixer, it was nice to be able to shuffle the mixer from one hand to the other while the bowl stayed in place. The ring also works to turn a pot and bowl into a secure double boiler. I have a couple bowls that fit well into a certain pot, but the Staybowlizer let me use a wider selection of bowls and several other pots - handy if I've got the usual pot in use or I require a larger or smaller bowl. And, the silicone makes a nice seal, so it keeps steam from messing up my melting chocolate. Since the bowl stays firmly in place on top of the pot while I'm whisking or stirring, there's no need to try to grasp a hot bowl on top of a hot pot of water, which is a plus. Since the Staybowlizer is made from silicone, it can be used as a trivet, and it's dishwasher safe. I plan on using it for pumpkin carving very soon, to let me rest the pumpkin at an angle without it trying to roll away. I'm sure there are other crafty uses for it, but I'm not all that crafty.